I absolutely love trying new and unique recipes. Finally am back with yet another bread snack recipe. 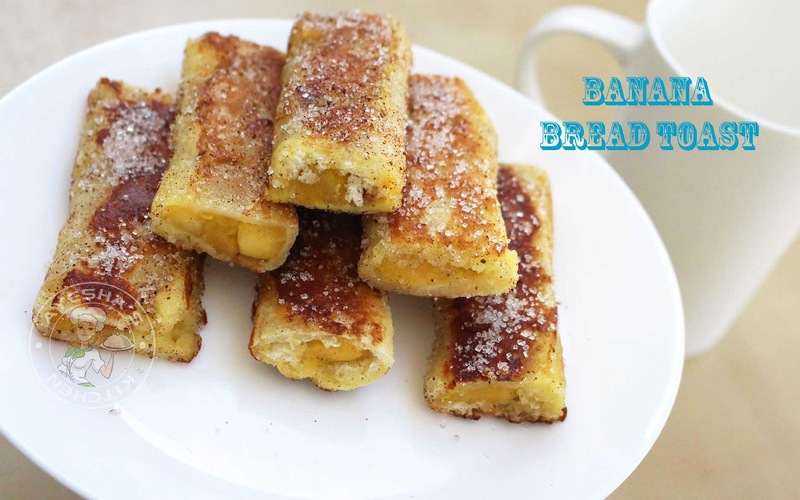 A very easy and simple bread snack that you can serve within minutes. This delicious sweet snack is made with ingredients which are commonly available in our kitchen. Ripe plantain and bread are the main ingredients for making this sweet treat. Ripe plantain recipes and bread recipes are always kids favorite. Isn't it? Like banana fritters, French toast, bread rolls etc. So here is a lovely twist to these snacks. 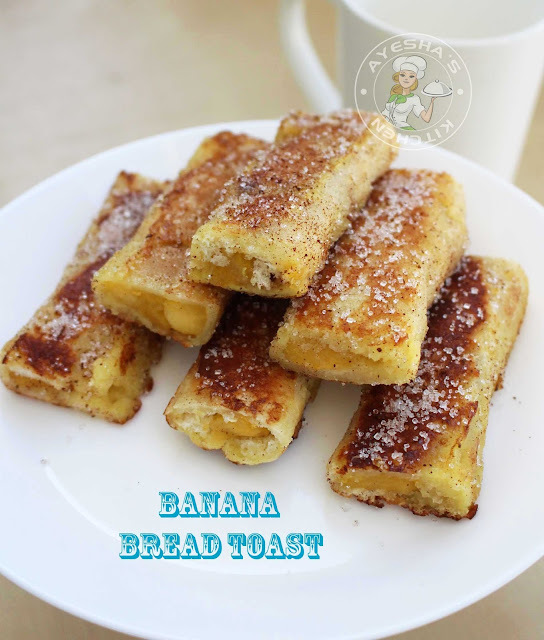 This banana bread toast or sweet bread rolls is one of the best snack box recipes for school going kids. As it is prepared with simple ingredients this has got to be the easiest snack recipe and it never fails. So here is the recipe showing how to make easy bread snack/ sweet snack recipes/ banana bread toast/ french toast/ yummy snack box/ kids recipes. Heat a pan and add ghee or oil. Fry the finely chopped plantain. Add sugar and again saute until slightly mushy. When done, set aside. Combine together egg, sugar, and milk in a bowl. Set aside this egg mixture ready. Remove the sides of the bread. Flatten each bread slice using a rolling pin. Now take a flattened bread slice, stuff it with stir-fried plantain. Roll it gently and seal the sides and edges with the egg mixture. Then again heat a pan with ghee. 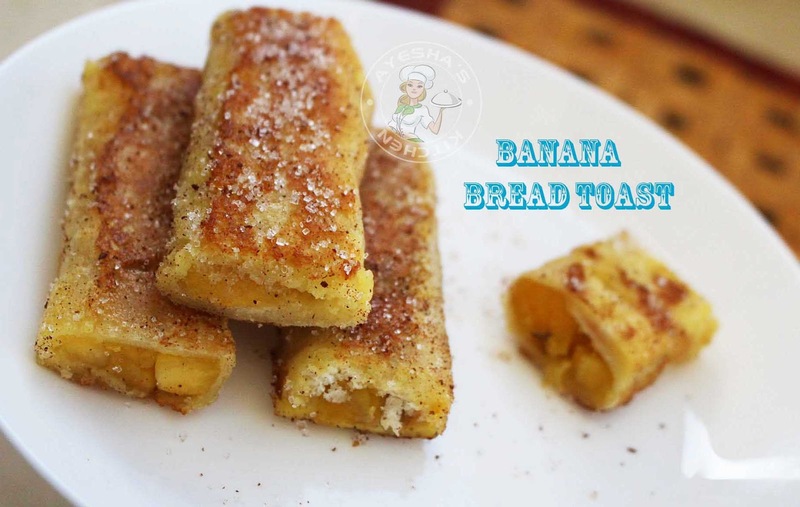 Dip each bread banana rolls in the egg mixture and slide it to the pan for toasting. Toast all sides over a medium flame. When done, transfer it to a serving plate. Now you can trim the snack for a perfect look. I just cut off both ends. You can garnish this snack by rolling it in powdered cinnamon and sugar mixture. Serve hot along with tea or coffee.